Since 2001 Live Wire, in association with the Limestone School Board, has offered very special concert/workshops at elementary and secondary schools in the Kingston area. Audience response from both students and staff has been overwhelmingly positive. Typically Live Wire sponsors between 20 and 30 workshops during the school year dealing with songwriting, instrumental and performance technique, careers in the music business and social change through music. Outstanding Canadian musicians such as Stephen Fearing, The Good Lovelies, Ember Swift, Teilhard Frost, Jane Siberry, Alan Gerber, Dala, Rick Fines, Ariana Gillis, Kate Reid and Rose Cousins have inspired and entertained about 3000 students per year. Thurs. Nov. 21 – Emily Fennell – Sharbot Lake, North Addington E.C. Fri. Nov. 22 – Emily Fennell – Sydenham H.S., LaSalle S.S.
Fri. Apr. 11 – Rueben DeGroot – Storrington P.S. Fri. Apr. 11 – Corin Raymond – LaSalle S.S.
Mon. Apr. 14 – Corin Raymond – QECVI, Bayridge S.S.
Thurs. Apr. 24 – Kate Reid – Sydenham H.S., Granite Ridge H.S. Fri. Apr. 25 – Kate Reid – LCVI, LaSalle S.S.
Fri. Apr. 25 – Eve Goldberg – Central P.S. Fri. May 2 – Jenica Rayne – Storrington P.S. Mon. May 12 – Wendell Ferguson – Sydenham H.S. Tues. Jun. 10 – Teilhard Frost – Loughborough P.S., Harrowsmith P.S. Wed. Jun. 11 – Teilhard Frost – Land O Lakes P.S., Granite Ridge E.C. Thurs. Jun. 12 – Teilhard Frost — Tamworth P.S., North Addington E.C. 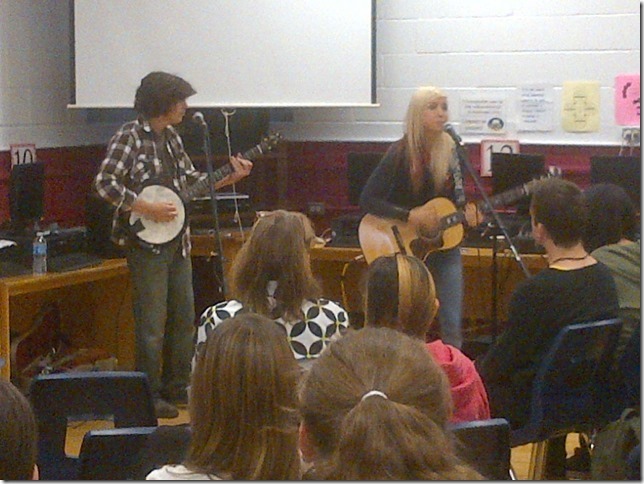 Just a quick note to let you know that QECVI had the great pleasure of hosting the folk singing duo Ash & Bloom today. This group performed for our students with wit, sensitivity, and grand artistry- again, most of our students would never get the opportunity to be exposed to live musical performances without the assistance from the Board and from LiveWire Series that brings musical artists into the schools. I am always moved when I see my students totally engaged and looking so joyful as they listen to the wondrous sounds of the various musicians sharing their talents. We can hope that these students will be touched and changed in a positive way by what they are witnessing. Thank you again for supporting all of these wonderful opportunities for our QE students. The power of music to heal lives and to motivate people is very clear and I am very grateful for the encouragement that I receive on a daily basis from my colleagues, my principal, Al Rankin and the artists themselves, to continue to enrich the musical lives of students. I just wanted to send a note of thanks and appreciation for Live Wire’s contribution towards bringing professional artists/musicians into the schools for our students to experience and enjoy. With the help of the Limestone Board we were able to bring in Wendell Ferguson this past Monday for an engaged audience of 60-70 in our new drama room, at a very reasonable cost. In the past my classes have also had the pleasure of hosting clinics and concerts by many other artists including Dala, Coco Love Alcorn, Ann Vriend, Emily Fennell, and Gareth Pearson to name a few. It is an invaluable resource to have students experience professional, passionate, world-class artists right in their classroom without the added costs of tickets and transportation etc. Thanks again for your financial support. 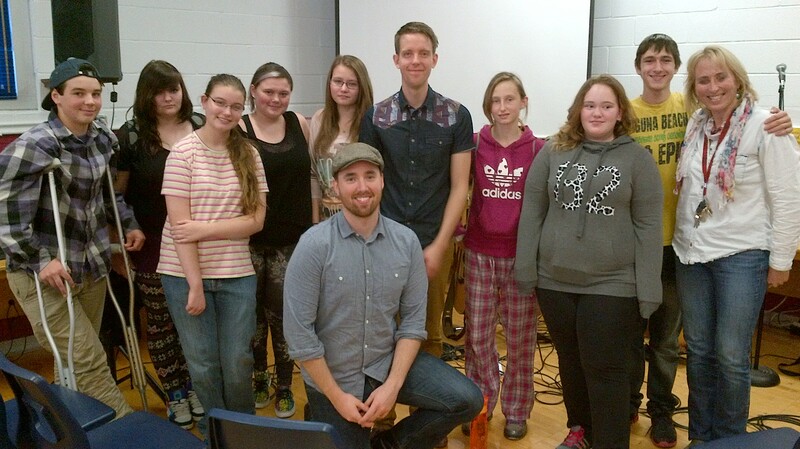 Hi, it’s Adam Clark from QECVI. I play acoustic guitar. Stephen Fearing’s concert was outstanding. He teaches students who are interested in that path on how to put on a show. His presentation was filled with humorous tips on how to improve yourself. He gave us some of the proper tools to be successful. I believe that having performers such as Stephen come to our school helps inspire young people to strive for their goals without doubting themselves. 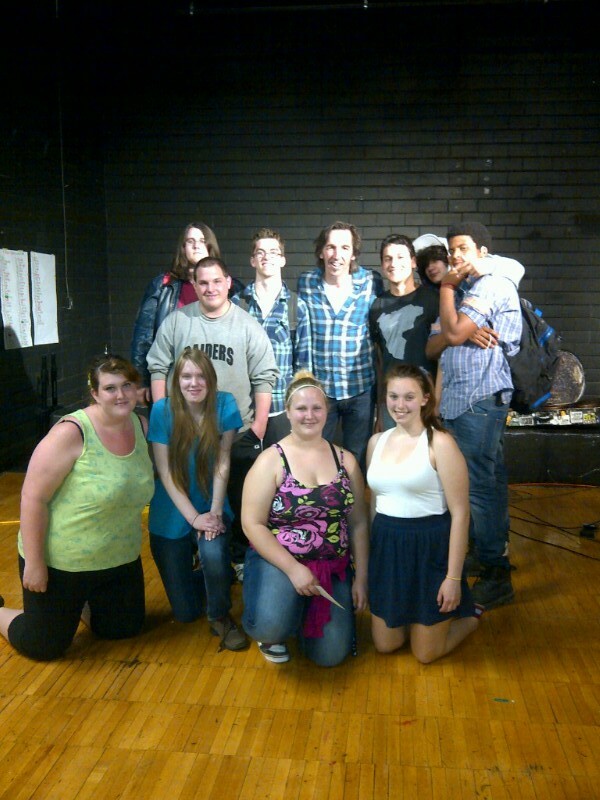 Thanks so much for bringing Stephen Fearing to QECVI. His performance was rich and inspiring. As an amazing bonus he spoke sincerely to our kids about following their dreams, about choosing a career path that is fun and meaningful, and he did it all with strength and humour. What a rich experience – for me as well as for the kids! The workshops were absolutely wonderful. It was amazing to see the youth, attentive, engaged, laughing, participating, performing, smiling and really enjoying themselves. Myself and the other teachers are so appreciative. As you know it can often be challenging to motivate these youth – but from the first performer on — there was never an issue. Sheesham and Lotus played here yesterday. They were fantastic! Kids and adults alike left the show talking about how interesting and entertaining it was. Their show was the complete package- and it was clear that they knew how to present themselves to younger audiences. I’m very impressed with their show, and want to thank you for suggesting them to us. I thought that I would pass on a couple of pictures of Ariana Gillis while she performed in the library at QECVI last week. Her musical and storytelling abilities were great. 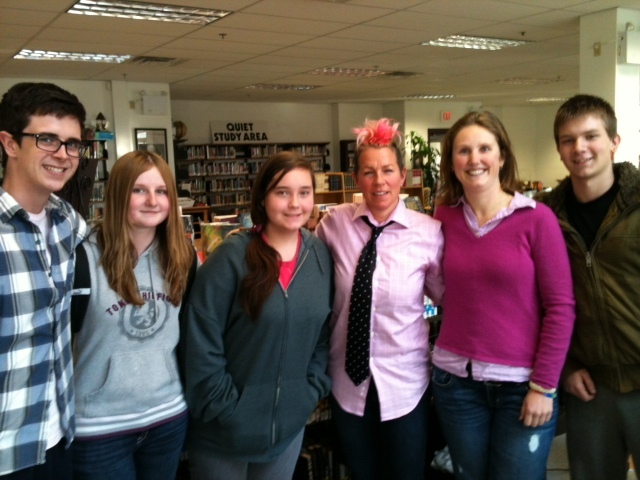 The students and staff were thoroughly engaged by her performance. Thank you very much to Al Rankin for connecting with us and to Live Wire for bringing her to town. Ariana’s comments regarding reading and the influence that has had on her art were appreciated by all in attendance. Just thought that I would share and say thanks to all who helped make this possible.